Selling or buying your new home can be overwhelming, so we decided to make it a little easier for you. 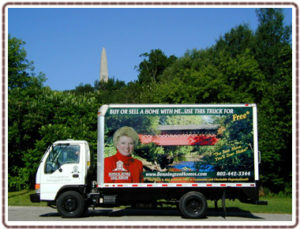 When you buy or sell your home through us we can help with the move! The Brenda Jones Real Estate Group offers a 16′ moving truck as a courtesy to all of our buyers, sellers, VIP members and local non-profit organizations for local transfers. Designed to make your move as smooth as possible, the truck comes equipped with a ramp, handcart, and tie-downs. Everything to get you on with your move… and on with your life! Hold a current automobile insurance policy. The truck is scheduled on a first-come, first-served basis, so plan as far in advance as possible by contacting Max Squiers at (802) 442-3344.